Killed this bird 2nd morning of 2012 season...took my dad opening morning and he busted one. Mine was 21 pounds, 10.5' beard, 1.25' spurs. 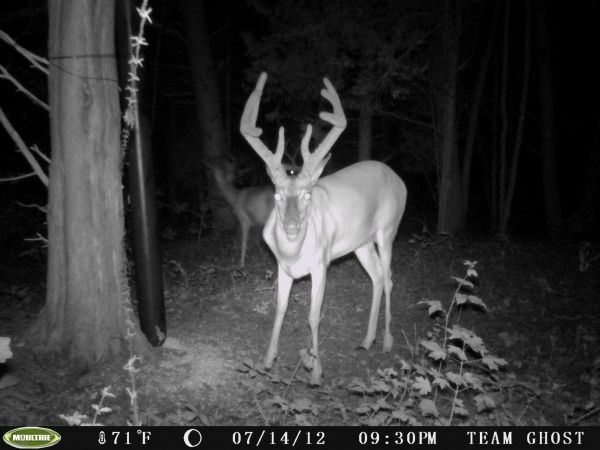 Nice buck, but still need a couple of years. He looks to be only two years old from the videos i've gotten of him. Someone posted a few days ago about feeders...I use a pvc pipe cut to 5 feet and painted. 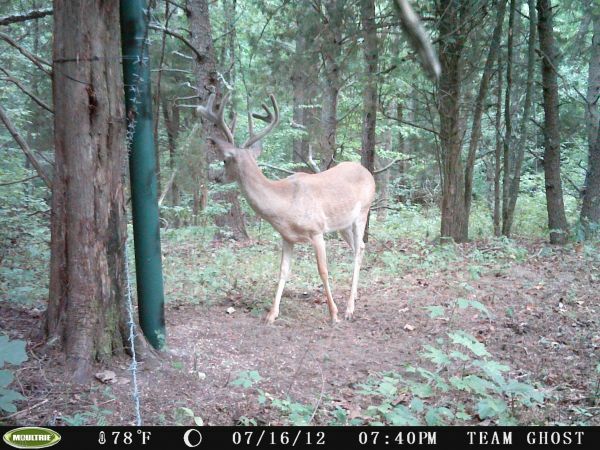 This feeder has only been up for three days but the bucks are already hitting it hard. I had 547 pictures of these bucks in the first three days. I caught this bruiser in late April out of a local farm pond. She was a shade over 12 lbs. GT, why do you have to question everybody that posts on this website? You were questioning Viper's bow speed the other day....did you see the chrono? Take his word for it man. And this young hunter just killed a buck bigger than anything you've killed in the past three years and you are going to question his actions in taking the other buck and his time in between shots? Give him a break. It was opening day and he was excited. You should be praising young hunters like this for a job well done. Don't question his actions. It's people like you that make me NOT post on this sight. Just try and choose your words more carefully. I got in late that morning, and when I shut my truck door I could hear the birds gobbling across the creek. They were roosted in a swamp that borders a field about 700 yards long. I got set up on a finger that goes out into the field. I never call to the bird on the roost unless i'm right under his tree. I've just killed more birds by not doing that. I kinda hunt old-school, call rarely and sparingly, just let the bird show his hand before I show mine. Anyway, I eased out to set up my pitiful hen decoy (she's been with me on every gobbler that i've ever killed, been shot four times, haha). That decoy is ugly as sin but doggone if she don't work. As soon as I stuck her in the ground I looked up and here comes a jake sailing out into the field. Luckily it was still dark enough and I could crawl back against a tree. He hit the ground and I did a fly down cackle. He tried to gobble but the two longbeards that were still roosted cut him off. I did one cluck, one purr, and they exploded. They flew down and immediately went into strut. Enter the ladies, stage left. They were roosted with two hens, but it didn't matter. There mind was made up and they were headed straight to my decoy, stutting, drumming, pushing each other around. They covered 100 yards in about 20 seconds and it was all over. 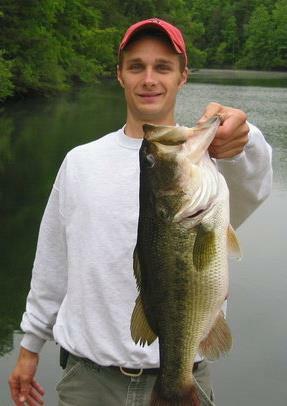 The weight is 20 lbs 13 ounces, and the spurs are both 1.25 inches. 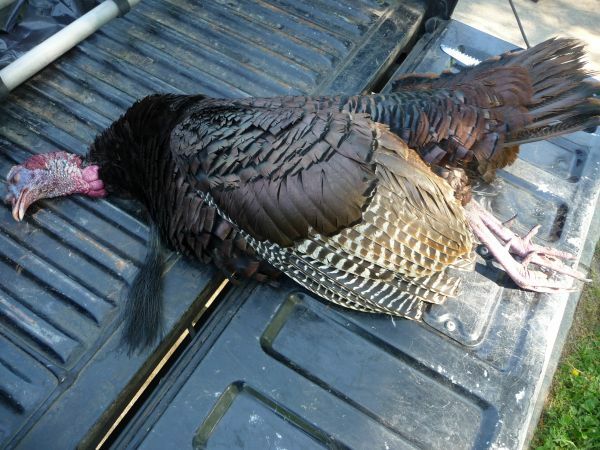 His bird should be the 31st biggest ATypical bird ever killed in the state, with a score of 98.3125!!!!! Impressive Buddy. I LOVE fishing with my wife.